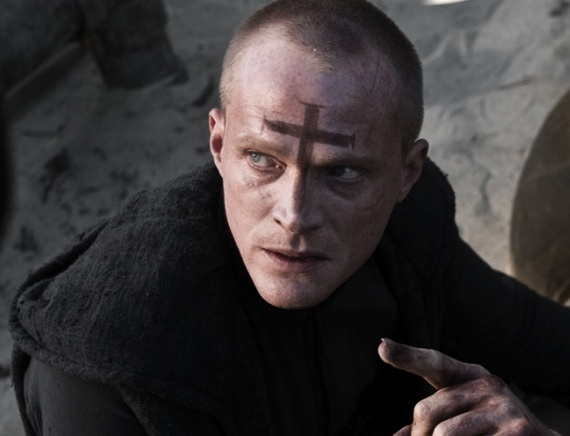 Paul Bettany plays Priest, a vampire hunter who learns his niece has been captured by vampires. The problem is the Church, which fully controls his city, believes that vampires have been completely eradicated. They warn him that “to go against the Church is to go against God”, yet out of love goes rogue after her anyway, much to the Church leadership’s fury. The Church enslaves the masses in this big fort, with surveillance, militarized police, and rampant pollution. After Priest leaves on his quest, the Church send 4 other priests to hunt down and stop our man, but they end up siding with the Priest because of the way the Church treated them, nearly destroying their faith. Together with a sheriff, they plan to hunt down the vampires and save the niece. Overall, the movie was a curious mix of a bunch of movies you have seen before, fusing the fight scenes and long coats from The Matrix with the aliens from Doom with the score from Batman and Paul Bettany channelling Christian Bale’s Batman voice, and futuristic, jet-powered motorbikes from a recent Star Wars movie. I guess this what is meant by the term ‘derivative’. Wikipedia describes it as a “post-apocalyptic dystopia science fiction action horror film”! The main characters, the Priests were probably the best part, and apart from the game of movie bingo I was playing, just managed to keep my interest throughout. The Church people basically were angry with the Priest and kept saying the same thing over and over. And as for the vampires – well, not a whole lot going on there, right?! While many of the characters were one dimensional, there were a couple of interesting scenes that were pleasing on a thematic level. The Priests, even though they were persecuted by the Church, they still maintained their faith, relying on the power of God for their strength and to do what they needed to do to save the city (despite the supposed warning about going against Church = going against God). It wasn’t as though they just magically cast a spell and all of their troubles disappeared. They still had to fight. And so it is in life, that God doesn’t just make all our troubles go away. We’re called to work for the good of people, expose falsehood, and most importantly sacrifice. In this way, we follow in the way of Jesus whose life was a ransom for many – actually he’s the high priest that sacrifices himself – I can’t see any of those Church leaders doing THAT! In the same way, we see here that characters are also prepared to sacrifice ultimately. In contrast, the villain of the piece was tired of the notion of sacrifice, and only wanted to live as he desired without restraint and without any authority telling him how to live. The final scene was particularly relevant to the discussion on the place of evidence in religious belief. In the beginning of the film, the Church believes that vampires had been eradicated, and maintains this throughout, though secretly you must wonder what they are scared of with these big walled cities. I guess that’s part of the control mechanism on one level, but if they were so confident that the Priest would find nothing, why bother sending someone to stop him? In the end, the Priest brings a vampire’s head into a Church meeting, the evidence that proves that vampires still exist despite the Church saying so. The Church leaders are shocked and in the face of glaring evidence to the contrary, still maintain their position. Finally, the Priest leaves the Church – probably the best course of action if the Church was so consumed by their desire for power. The Church will lose credibility and thoughtful people will leave the Church if it closes its eyes to the evidence before it, though I think it’s also clear the Priests (the vampire hunters) retain their faith. But in painting one faith institution as failed, does Priest paint all institutions in that colour? Now I would remind you, brothers, of the gospel I preached to you, which you received, in which you stand, 2 and by which you are being saved, if you hold fast to the word I preached to you—unless you believed in vain. 3 For I delivered to you as of first importance what I also received: that Christ died for our sins in accordance with the Scriptures, 4 that he was buried, that he was raised on the third day in accordance with the Scriptures, 5 and that he appeared to Cephas, then to the twelve. 6 Then he appeared to more than five hundred brothers at one time, most of whom are still alive, though some have died. 7 Then he appeared to James, then to all the apostles. 8 Last of all, as to one untimely born, he appeared also to me… 14 And if Christ has not been raised, then our preaching is in vain and your faith is in vain. 15 We are even found to be misrepresenting God, because we testified about God that he raised Christ, whom he did not raise if it is true that the dead are not raised. 16 For if the dead are not raised, not even Christ has been raised. 17 And if Christ has not been raised, your faith is futile and you are still in your sins. To conclude, Priest had a couple of good scenes and themes, and surprisingly for me characters were not just supernaturally superpowered in and of themselves. At 87 minutes, it’s borderline whether you should watch it: the film isn’t long compared with most other movies, but the final battle eventually left me wanting it to end. If you don’t like horror films, give it a miss. The gore was stronger than the M / PG-13 rating but in saying that I don’t generally watch horror(-ish) movies. Even if you do like horror films, you might give it a miss anyway. Maybe try church instead.